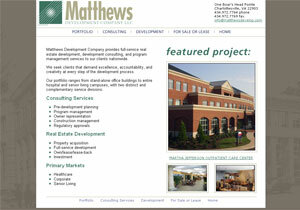 Matthews Development Company provides full-service real estate development, development consulting, and program management services to clients nationwide. The original site was created 2000. It consisted of three simple pages with a few small images. They came to drw Design in 2005. The company wanted a much more comprehensive web presence that would show off their impressive portfolio and describe the services they offer. They gave us some printed materials and CDs full of images. We organized everything into a comprehensive whole, with nice slide shows in the portfolio area. We created a design that had an understated, sophisticated look. 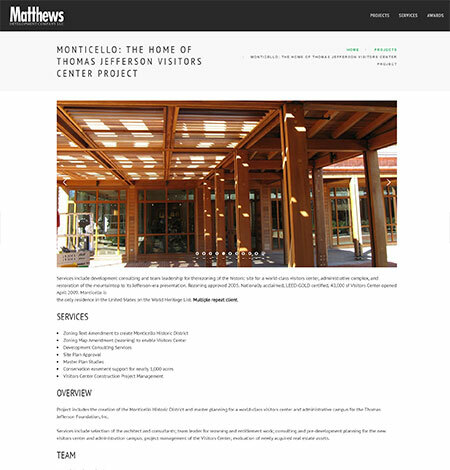 In 2011, we did a redesign. We made the slideshows bigger and bolder to show off their beautiful work. We put the site into a proper content management system. We also made the slideshows look great on mobile devices, which was important to our client. In 2018, we redesigned once again. 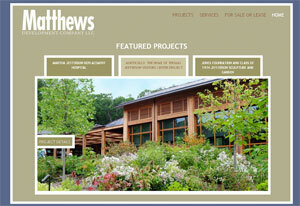 The site has a more contemporary look. We upgraded all the code, added a bunch of projects and generally made everything nicer!